Let’s talk about how easy it is to make this salad, because you all need to try it. It’s that good. If you have any friends or family in denial about brussel sprouts still just serve them this salad and be prepared to say ‘I told you!’. 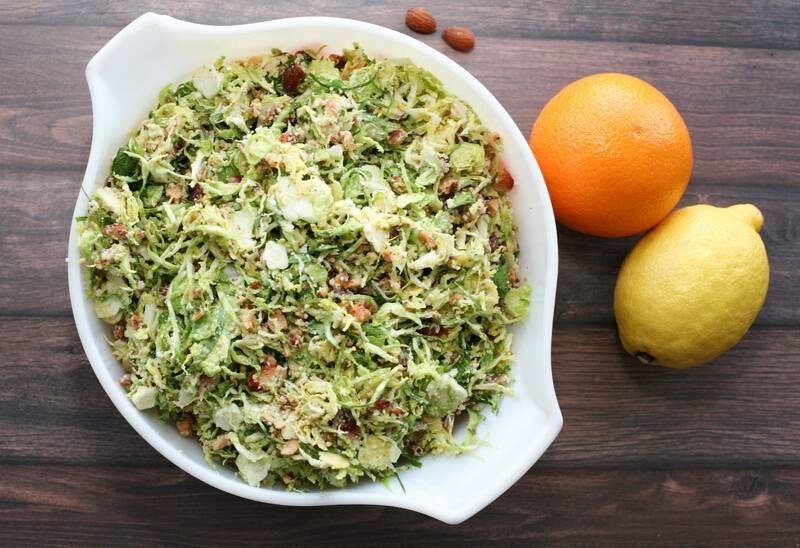 Your salad ingredients are super simple: brussel sprouts, bacon, parmesan cheese and almonds. As suggested from the awesome blog where I found this recipe, I used a mandoline slicer to shred the brussel sprouts. Yes, this is a little time consuming going one by one but it’s worth it to get that perfect texture and lightness in the salad! Just be careful you don’t cut your fingers! My Grandma gave me this warning when she gifted me with the mandoline slicer a few years ago, at which time I used it mainly for prepping fried potatoes. My ninja food processor came to the rescue yet again to finely chop the almonds. That ninja makes my life in the kitchen so easy. Oh! and I let my bacon cook in the oven while I prep the other ingredients. Just be sure to set a timer if you’re a tad forgetful like me so your bacon doesn’t get over-crisped. And now you can toss the salad ingredients together and set the bowl in the fridge while you make the dressing. Dressing ingredients: juice from one orange and one lemon, apple cider, shallot, olive oil, salt and pepper. Easy peasy. Except for the part where the shallot makes you cry. Do not let the size of those tiny onions fool you. I seriously need to take back those onion goggles we gifted my Dad as a joke on his 50th birthday. He’s not wearing them and my eyes would thank me. No joke. Anyway, after you have a good quick cry and your dressing ingredients mixed together, whisk for a least a minute straight to get a nice creamy consistency. Last step is to add the dressing to the salad and toss to combine! Do this right before you’re ready to serve it. On the day of our family Christmas, I had both items made up separately for a about four hours before tossing and serving it. I just gave the dressing a good shake before pouring it on the salad. I already know tomorrow’s going to be a great day. Not only will we have leftover bacon brussel sprouts salad in the fridge, we get to sleep in, we’re planning to go to the movies and it’s going to be 27 degrees!! If ya’ll don’t live in the northeast part of the States, it’s been frigid lately. We’re talking highs in the single digits. So 27 tomorrow and 36 on Monday is going to be feeling ah-mazing. I do like the cold weather from inside our home though; there’s something dreamy about fireplaces going, cozy rooms and hot drinks. Every season has something wonderful to offer. Come back and let me know if you make this salad! I hope you enjoy it as much as I do! 2 Tbsp apple cider juice not vinegar! Cook bacon in the oven at 350 or over medium heat in a skillet. While the bacon cooks, shred brussel sprouts over a large mixing bowl using a mandoline slicer. Remove cooked bacon from the skillet/oven and lay slices on a paper towel to absorb the grease. Once cooled, chop or crumble into small pieces and add to the bowl of shredded brussel sprouts. Use a food processor to finely chop the almonds. Add chopped almonds to the mixing bowl along with the parmesan cheese. Gently toss to mix all salad ingredients and set aside. Add all dressing ingredients to a small bowl. Whisk for one to two minutes to reach a creamy consistency. This entry was posted in Recipe Book, Sides. Bookmark the permalink. What a great salad! Perfect for a potluck! Thank you! Yes! It’s definitely become one of my go to potluck dishes! This salad looks so good! Can’t wait to try this! This recipe is soooo good! I love the texture of the thinly slices Brussels sprouts! Me too! If you have a mandolin slicer it works perfectly for this! Definitely my kinda salad. Brussels sprouts are my favorite, especially with bacon! Love a good lettuce-free salad. This looks delicious! mmm, yes….I am definitely making this!! All my favs! There was recently a recall on my fave bagged brussels salad, this looks like a FAR better choice. oh no!! Yes, this will be a perfect alternative and it makes a lot so just keep the salad and dressing separate and you can enjoy it for days! Oh my goodness, this sounds delicious. I love the brussels sprout and bacon combo! Yes, they pair together perfectly! What a great flavour combination! Looks delicious! Awww it looks so delicious! Totally love it! love the idea of adding nuts into it. Great. Yes! I love the added crunch element too! This salad is just packed with all the yummy flavors! I’ve cut myself on a mandoline more than once, but it’s definitely worth it for the job it does! Ouch! It’s definitely a little tricky with the small brussel sprouts!